Managing internal and external communications can be difficult, and just as difficult - finding the best outlets to help. Our communications staff relies on two websites specifically to keep our heads from flying off - Hootsuite for managing social media and Trello for managing ourselves. In this day and age, it’s vital that your social media accounts stay current, active, and organized. This is where Hootsuite sweeps in to save the day. Through Hootsuite’s platform you can manage multiple networks (Facebook, Twitter, Instagram, etc.) all through one page, making the overwhelming world of social media seem, well slightly, less overwhelming. The user friendly set up works for all skill levels, you don’t need to be under 30 and tech savvy. Our favorite part of Hootsuite is that it allows us to schedule tweets, which helps us plan a day or two in advance, schedule tweets for the weekend or holidays, and look over each other’s tweets prior to posting. It’s also completely cross platform, meaning that it functions well on Mac OSX, Windows, Linux, and mobile platforms. For the nonprofit community, this tool has the added benefit of being free (the standard version), which makes this a realistic option for increasing the extent of your communications reach. Trello is a personal favorite of mine, and I use it to organize my life – work related and otherwise. Think of it as a day planner with endless tabs and options, never running out of space or needing white-out. When you open Trello, you are shown your first board. Each board you make can be for a different project, trip, event, or anything you need to organize. Within each board, are lists of tasks that need to be done – with customizable labels and checklists within them. So what exactly makes this so great for work? Beyond just being visually stunning (there are some seriously high quality photos to customize each board with) and user friendly, Trello is the ideal project management tool. You can share boards with others, assigning lists and tasks to your team members in a way that allows for everyone to be on the same page and finishing tasks by assigned due dates. Like Hootsuite, the standard version is free to use and completely cross platform as well. Another really cool aspect to Trello is that is works in real time, you never need to refresh to see updates and any changes your team mates make happen instantly on your end. There are plenty of free tools out there to discover that can make your life easier, but I personally recommend starting with the two I have mentioned if what you need is a little more organization and social media management. The real selling points of Hootsuite and Trello, however, are how they are truly made with the visual human in mind. A simple layout that can manage many layers of information is rare and, with so much to juggle in the 21st century, it is crucial. Planning for the 9th Annual Choose Clean Water Conference began in July of 2017 with the selection of our host city. We knew it was time to return to Pennsylvania, but the question was, should we go somewhere new or return to a previous host city? It was pretty clear, after looking at several potential locations, that the only place that would fit our growing conference was Lancaster. The last time the conference was in Lancaster, we were only in our third year, and the landscape of the Chesapeake Bay restoration effort looked much different. With the pending results of the midpoint assessment coming, Lancaster offered us the ability to talk about many of the issues we face regarding the clean up, especially when it comes to agriculture and stormwater runoff. After two days of sessions, workshops, speakers, and networking, it seems as if we all walked away with new ideas, connections, projects, and motivation, and, as shocking as it may seem, we are already starting to plan for next year's conference in Baltimore! I wanted to thank everyone who helped put this conference together - our 12 person planning committee, the staff at NWF, the Coalition's steering committee, our incredible sponsors, and Chante Coleman and Mariah Davis, who went above and beyond in planning sessions and finding incredible speakers. See you in Baltimore in 2019! The internet as we know it is constantly expanding. For businesses and non-profits, managing social media and websites may seem daunting at times. Some may be curious about their following, user engagement and interactions. Luckily there are many tools and apps that are available, making it easier to find out the information you may be looking for. Analytics apps help to track your organization’s website and social media progress, and will provide insight about what is working and what is not. Google Analytics is a well-known analytics tool and is available on two platforms – mobile and desktop. The mobile version is free for both iOS and Android users and the app provides a full dashboard for full performance insights. Users: New and returning user information, their country and language are provided. Acquisitions: Provides information about new users. This tracks their location and how many times they have used the app. Engagement: Event tracking is available to receive reports about website speed, exceptions and crashes. Outcomes: There is an option to set up goals and see the goal flow. Localytics is another popular mobile analytic app. This is available on various platforms including iOS, Androis, Windows Phone and BlackBerry. This is an easy app for new users. This app is free, however there are also options for an unlimited version. Localytics has many customization features to let the user track what they want. App usage and reports: Includes locations, device, carriers and users. Users and sessions: Provides time periods and new/returning viewers. Audience: Includes user interest, type of users and demographics. Usage: Provides information about active users, their sessions, average session lengths and frequencies. Technical: Shows the type of devices used, carriers and errors. Heatmaps: Provides information on performance, user navigation and preferences. This aspect shows exactly how and where users visit on the site. Crash reporting and videos: Include in-depth, real time recordings and crash session if there are any issues with the website. This is a huge plus for new websites and apps. Real-time analytics and alerts: Provides insightful analytics on behavior. Also provides alerts for monitoring crashes and KPI changes. Flexible configuration: Helps to provide easy data integration. Intuitive drag-and-drop interface, which is customizable. Integration with Google Analytics to provide tracking information. Summaries with crucial data for your platform. As you can see, there are many mobile apps that focus on tracking different app and website information. Whether you are interested in simple analytics, heat maps or customization – there are many options for you! It feels like everyone has something to say these days — which isn't necessarily a complaint; there is a LOT to be talking about! An unfortunate byproduct of this is that getting heard is a lot easier in theory and not in practice. With the information and content overload that we sift through daily, employing different communications tools and strategies is a requirement to ensuring that your message is being transmitted as efficiently as possible. While large organizations have communication departments at their disposal, smaller groups have to make due with what they have. Luckily, several game-changing communication tools exist online and can punch up your organization's communications to compete with the big guys. A social media must-have, Hootsuite is an absolute necessity for any organization that interacts with social networks (So... every organization!). This platform, with a totally fine free package and optional premium features, syncs all of your organization's social media platforms into one headquarters. Gone are the days of switching tabs between your org's Facebook, Twitter, YouTube, Instagram, Wordpress, and Google+ profiles... it's all in one place! 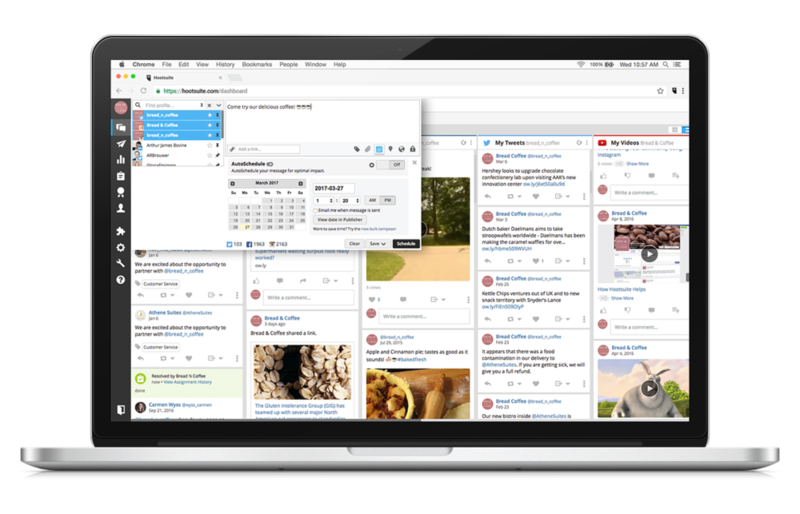 With handy engagement tabs that display all of the mentions and interactions between other profiles and your own, Hootsuite makes having one unified voice on social media easy. It's also great for scheduling posts, so that your brand can maintain steady communication based on your needs. The premium suite of features has some great resources, the best one being the analytic reports. Their comprehensive reporting tools can narrow down your audience demographics to a T, which is essential to crafting content that will be noticed by your intended audience. So you have all of your social media in one place... but what do you post? You may have some messages you want to get across, but maybe you don't have a way to make them appear very interesting? Fear not, for Canva is here to make everything pretty and readable. Another free service, with premium options that are way less significant than the previous platform, Canva helps you create beautiful graphics to liven up any social media post. You needn't be a creative genius; Canva has a crazy amount of templates with wide arrays of color palettes already selected (but they're customizable too if you're feeling inspired). The user-friendly service makes infographics, blog graphics, Instagram posts, event headers, and many more attainable for everyone. Similar to Hootsuite yet a bit more focused, TweetDeck is a valuable resource to get the most out of your organization's Twitter. Keeping up with the theme of free services, this platform puts all of the most important pieces of your Twitter on one screen. Divided into columns, you can see all of your organization's mentions, follows, tweets, and other related activity. The best part of TweetDeck, however, is it's ability to throw you right into conversations you want to be a part of. By adding more columns — formatted to show you tweets containing keywords or specific hashtags — you can view the notable and ongoing pieces of the subject most important to your organization. Whether you want to measure the success of a campaign or gauge public response to an idea or product, TweetDeck is a godsend for making sense of your often over-saturated Twitter feed. Maybe the name "Free Photoshop" would've violated some copyright laws, but the Pixlr Editor might as well be called that for how close this complimentary service is to the classic program. Pixlr is the place to go when you need to make your photos ready for anything Communication related. It helps to have some background knowledge of how to use Photoshop, as Pixlr's features mimic most of PS's functionalities. Pixlr is great for quick edits, creative overhauls, and even branding images! Last off is a service that targets the most-used communication platform of any organization: Email! MailChimp is an automation service that helps you build email lists like a pro. Whether your marketing something or sending out a newsletter, this program makes reaching lengthy contact lists simple! While the sending of the emails is a huge help, the real fun comes with the analytics reports, which detail how many people opened your message and what links they decided to click while you had their attention. MailChimp helps you make the most out of your emails and gives you a great idea of what your subscribers want to see. MailChimp offers a great start of features for smaller businesses and has various levels of price plans for varying sizes of organizations. Communicating to your organization's best potential isn't difficult when you have the right tools! Joe DeWitt is a communications intern at the Choose Clean Water Coalition. Generation Z is roughly defined as anyone born in or after 1998, making the oldest of that group 19 years old (Take a second to feel old - I am.) While it may seem that everyone who grew up with filters on photos and never experienced the sound of dial-up internet (shudder) all belong in the same generation, there are some big differences in how GenZ sees the world vs Millennials, which impacts how they should be targeted. Millennials (the time frame varies, but generally people born between 1984 to 1997. Don't even get me started on Xennials.) tend to look at the world as their oyster and that opportunities are everywhere. They are optimistic , sometimes to a fault, and value a positive workplace over pay. GenZ has grown up in a time of global terrorism, climate change, violence in schools, etc., so to say they are a little more cautious may be an understatement. They watched their parents struggle during the Great Recession, so they are more realistic about opportunities and look for stability and security. GenZ also prefer face-to-face communications more than their Millennial predecessors, and favor tech tools that encourage that, like Skype, Facetime, and Snapchat. The most important causes to them? Children and youth, education, and animals. They grew up in the Great Recession, making them cautious about money, more likely to save than spend, and they want to know their money is going to actually do something. They got their first social media account at 11 years old, on average. Gen Z believes that climate change is the biggest challenge facing the world in the next decade. 63% favor solar energy. 58% have recycled. 31% have boycotted a company that has hurt the environment. So what do we do with all of this information? It is important to remember who our target audience is and what appeals to them when creating communications strategies and campaigns. For now, it looks like the new generation of potential clean water supporters are primed and ready to be activated around issues that they care about, especially climate change and wildlife. We are challenged though to prove to this generation that their time and money are actually going toward making a change (X number of trees planted when you donate $X). Now if you'll excuse me, I have to find this building where you can send mail by hand with something called a stamp? Weird. Environmental stewardship youth engagement programs aren’t what they used to be. A generation ago, most kids grew up spending lots of free time outdoors—those connections to nature are how many people first learn environmental ethics. And back then, there weren’t so many exciting activities competing for teens’ attention. Environmental educators and mentors have had to change their approaches. So when West Virginia Rivers Coalition planned a pilot youth engagement program focusing on two Chesapeake Bay tributaries, we did three things before we put pen to paper. First, because our goal was to use youth engagement to help build watershed groups' capacity, we surveyed our Choose Clean Water Coalition watershed partners in the Eastern Panhandle. They said they needed help reaching out to young people and their parents. They hoped teens would be ambassadors to other teens and parents. Then we queried young adult leaders of youth programs to get their advice. The takeaways there: Empower teens to be self-directed, and incorporate technology. Finally, we teamed up with two amazing West Virginia Choose Clean Water Coalition partners, Warm Springs Watershed Association (WSWA) and Friends of the Cacapon River (FCR). Together, we set about trying to create a program that could be replicated across the Chesapeake Bay watershed. The resulting program is OneWatershed, a scheme to empower youth as ambassadors and leaders that we marketed as a film school. Our recruitment invitation says it all: “Are you an aspiring storyteller or filmmaker? Want to learn to make films and produce news by telling the stories of Warm Springs Run and the Cacapon? Those “things,” of course, are phones and tablets. And so Jack, WSWA’s Kate Lehman and the FCR’s Rachel D’Agostino planned out a weeklong film camp. In addition to the technical elements of filmmaking and editing, the workshop hosted people with stories to tell: a sportsman whose life has been enriched by the Cacapon, a retired sewage treatment plan operator, a local fifth generation business owner, and more. WSWA and FCR took on the task of helping to identify these interview subjects. They also recruited watershed experts from agencies and nonprofits to present on watershed topics for a short time each morning—sessions which sparked curiosity in our filmmakers. Each group also planned events that could be filmed for stories. For example, WSWA conducted a stream monitoring program that was filmed by students. On the first day of camp, when it was time to set up the iPads, I asked if any of the kids has an Apple ID. “Duh. . .” Of course they did. Did we give them instructions on setting up their new “cameras”? No, of course we didn’t. Did they take to creating stories about streams and the connections between people and water? Indeed, like fish in water, they needed no help learning to swim. Seven teens attended the pilot program. They all say they learned way more than they thought they would. But it’s safe to say we adults learned so much more from our teen filmmakers: about how kids naturally know how to collaborate with people different from them; about how they are capable of using technology to explore being human—not detract from it; and how their approaches to environmental stewardship are going to different than their parents’, and that’s okay. We’re sorting through the practical lessons of the pilot, especially how the model can be both effective and replicated watershed to watershed. We look forward to sharing those ideas with the Choose Clean Water Coalition community. In the meantime, have a look at some of our short videos at www.wvrivers.org/news/onewatershed.